After tech giants testified before Congress last week, Americans should realize the richest and most powerful U.S. companies wield power and influence in a way not seen since the railroad tycoons and John D. Rockefeller’s Standard Oil. Their ability to affect society and crush any potential competitors is unchallenged. Facebook, Amazon, Google, and Apple have a combined market value of $2.6 trillion, which is larger than the entire economy of the United Kingdom. Executives and employees of those companies are also very large donors to the Democrat Party and left-wing causes. They all have vocal Democrats at the helm. Today’s tech companies are even more powerful than their historical monopoly predecessors because of one key component: data. The information derived from our data is now king in everything from selling a product to shaping the news to—as we are now seeing—electing a president. The Left is well aware of this power. After losing to President Trump, they are determined to shut down conservatives and not lose again. Google just announced it would partner with the George Soros-backed Poynter Institute to provide “fact-checking” for its search functions. In other words, Google and Soros (by proxy) will determine what is factual and whether it will appear in search results. This suppression of views is occurring even as Google is being sued by conservative radio host Dennis Prager over censorship of his Prager University educational videos. Apple recently removed a pro-life prayer app from its App Store after left-wing bloggers complained about it. Amazon admitted to taking down negative reviews of Hillary Clinton’s book. Former Facebook employees admitted they were instructed to remove positive news stories that were trending about conservatives to reduce their reach. And let’s not forget Twitter, which has now openly set itself up as the arbiter of acceptable speech. Twitter recently removed U.S. Rep. Marsha Blackburn’s video announcing her candidacy for the U.S. Senate because it expressed her pro-life position. After considerable backlash, Twitter relented and reinstated the Tennessee Republican’s ad. These companies are so big and powerful that they have no fear of blatantly censoring conservative speech—they will even censor Blackburn, who chairs the communications and technology subcommittee in the House of Representatives! Just imagine how they can use opaque computer algorithms and terabytes of data to exploit the views of the average person. It is important to recognize that these companies can do this because they have special protections not afforded other industries. In 1996, to spur growth during the early years of the Internet, Congress passed Section 230 of the Communication Decency Act to protect “interactive computer services” from lawsuits based on what users say or do on their systems. Section 230 also immunizes Internet companies from liability for removing content they deem “objectionable,” even if it is constitutionally protected content. Helping foster the growth and economic development of the Internet with particular—and extraordinary—legal protections might have made sense in the 1990s. In 2017, however, extraordinarily wealthy and powerful companies are abusing those particular provisions. Congress never intended to give a handful of Silicon Valley executives the keys to the First Amendment when it adopted Section 230. 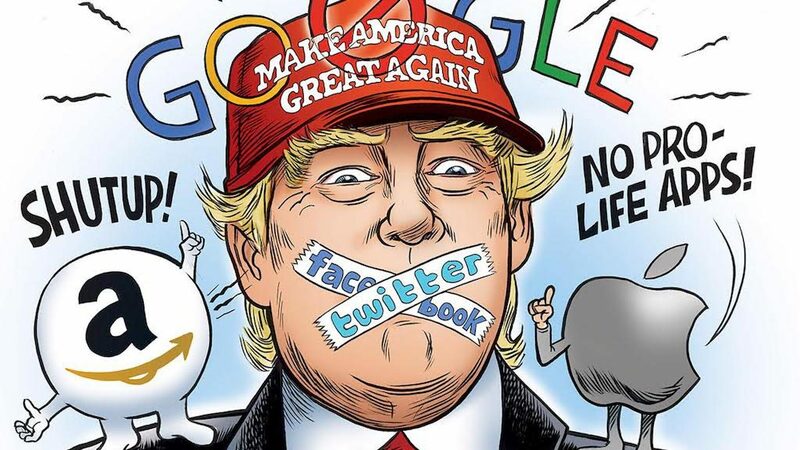 Technology companies cannot simultaneously claim special legal status and pose as speech arbiters censoring conservative views. They are run by some of the most vocal left-wing executives that are actively pushing their ideology on the country. Allowing these same companies to silence opposing views is dangerous. The most immediate legislative solution would be to remove the legal protections of Section 230 should an “interactive computer service” be found to practice viewpoint discrimination. Opening these companies to full legal liability for censorship is essential to ensure Americans keep free speech rights. It is time for Congress to act to protect the First Amendment and the values fundamental to the Republic.